It was a sprint to the finish for a historically low scoring Art Ross Trophy race in the 2014-15 season, which saw Dallas Stars’ captain Jamie Benn take home the honor with only 87 points. Benn’s point total tied for the lowest scoring Art Ross Trophy winner in a non-lockout season in the NHL expansion era. The other 87 point Art Ross winner in that time frame, Blackhawks legend and Hall-of-Famer Stan Mikita, won the award in 1967-68, the year the NHL expanded from 6 to 12 teams. In Mikita’s Art Ross season, he had a 1.21 point per game average (72 games), while for Benn, his point per game average at 1.06 (82 games) is by far the lowest of Art Ross winners in the expansion era. The goals-for average for NHL teams in 1967-68 was 2.79, which is not far off from the 2.73 goals-for average in the 2014-15 season. Benn had the benefit of playing on a Stars’ team that despite missing the playoffs, finished second in the league with a 3.13 goals-for average, clearly well above the NHL average. Mikita’s Art Ross season, the year following expansion, saw a dispersal of talent across the league, much the same as the modern salary-cap NHL. Following the 1967-68 season, team’s goals-for average steadily increased year after year, topping out at 4.01 in 1981-82, and didn’t reach as low as Mikita’s Art Ross season again until 1997-98 (2.64). That was the beginning of the “dead puck era” in the NHL, which saw goals per game reach as low as 2.57 in 2003-04, a year that Martin St. Louis captured the Art Ross trophy with 94 points. Scoring trends aren’t quite that low in the current NHL, but Benn’s record-low Art Ross season can likely be attributed to an era of hockey where, more than ever, we see elite goaltenders and an increase in the overall quality of players. Only eight players with 60 or more games played had at least a 1.00 point per game average in 2014-15, which is clearly a testament to just how tight the competition is and how hard goals are to come by. What makes Benn’s Art Ross Trophy win improbable is the tear he went on in the last leg of the season to move ahead of everyone in points. With 12 games left to play, Benn had a mere 64 points in 70 games. However, Benn caught fire and finished with 12 goals and 11 assists for 23 points over his final 12 games, including 13 points in his last five games. Heading into the final day of the season, Benn sat in third with 83 points, behind Sidney Crosby and John Tavares, who each had 84. Crosby went pointless in his final game and Tavares had two points to finish with 86. Meanwhile, Benn had a hat trick and an assist in game 82, his 87th point coming on an assist of a Cody Eakin goal with 8.5 seconds left in regulation to take sole possession of first in the NHL points race. You’d think by the Stars’ celebration on Eakin’s goal that this was a more meaningful game for a team missing the playoffs. Nonetheless, it’s fun to watch players who are cheering after a goal go straight for the guy who had the second assist. 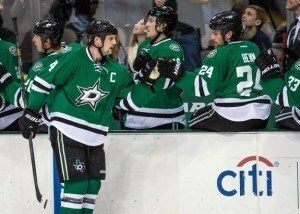 Benn’s feat is even more impressive because of the later revealed injury he had been battling most of the season. 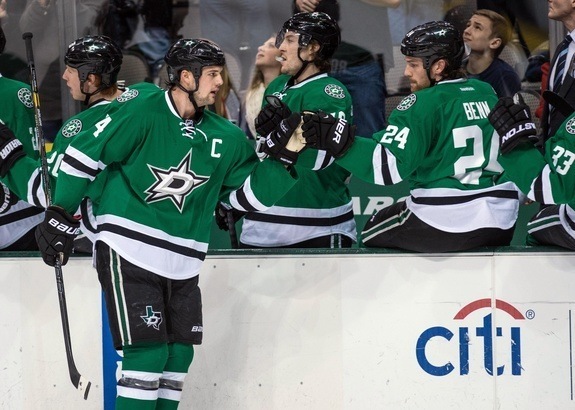 Stars captain Jamie Benn needs hip surgery. Played through it most of the year. And won scoring title. Pretty impressive. Benn had played through the pain before having double hip surgery in the offseason. While evident at times, the hockey world never heard a peep all season and amidst his injury, the 25 year-old Benn put up the best year statistically of his career. Apart from the mental toughness demonstrated through his entire Art Ross season, Benn was a physical force as well, as his 120 hits and four fighting majors were good for first and third among Stars’ forwards, respectively. Whether or not Benn would’ve been resting at the end of the regular season had the Stars been playoff bound is unclear, but judging by the toughness Benn demonstrated his entire Art Ross season, he likely would’ve endured it. While most fans generally hope for a higher scoring race than what was the 2014-15 season, the drama surrounding Benn’s Art Ross Trophy win was more intense than most years, a treat not always enjoyed in the NHL. And based on scoring rates in the NHL over the last several seasons, this kind of tight competition seems to be the way the league is heading.